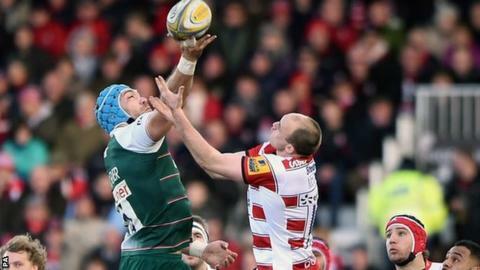 Leicester scored two late second-half tries to come from behind in a frantic finale for an exciting Premiership victory over Gloucester at Kingsholm. Trailing 12-7 at half-time, Telusa Veainu got one back before Tommy Bell converted fellow replacement Logovi'i Mulipola's late try in the corner. Gloucester's two first-half tries came from James Hook, who finished with a 13-point haul, and Ben Morgan. Marcos Ayerza scored Leicester's other try, his first in 95 matches. Tigers' winning try came after the home side had been reduced to 14 men for the final five minutes. England forward Morgan was yellow carded after being adjudged by the TMO to have held back Veainu when he looked set to be handed a scoring pass. Gloucester made seven changes to the side that completed their European Challenge Cup group games with a 100% record to win 14-11 in Italy against Zebre last weekend, Billy Twelvetrees captaining the Cherry and Whites against his former club. Leicester were without Ben Youngs and Dan Cole, who are away on England duty, the suspended Tom Youngs and the injured Manu Tuilagi, who has tweaked a hamstring just two games into his return after a 15-month absence with a groin problem. After 22 minutes without a score, Gloucester then scored twice inside two minutes. Hook broke through to convert his own try before the home side got away with a forward pass to cross again through Morgan in the corner, Hook hitting the post with the conversion. Ayerza then scored after Tigers cashed in on Freddie Burns' kick-through. But, although the Leicester stand-off converted, he failed with three penalty attempts - and instead it was the first of Hook's two penalties that stretched the home side further clear at the break. As in the first half, there was no scoring in the first half of the second period, and Gloucester still led 15-7 with 12 minutes left. But winger Veainu got one back and, although Burns again missed, Bell held his nerve to land the all-important conversion when Leicester crossed again. "It [the yellow card] was a big decision. There was some contact, no question, but it certainly wasn't the reason we lost the game. "The game was very much in our control but a couple of key errors at key points of the match meant we couldn't build the score. "We got ourselves into a position to win the game. The first 15 minutes of the second half, we had a lot of territory and possession, but didn't manage to take those opportunities. "Against the top teams, you have got to take opportunities as they came along in the opposition 22." "I was pleased with our resilience to stay in the game. I am pleased we stayed in the arm-wrestle. "Gloucester should have taken advantage of the opportunities they had, and they didn't, and it always comes back to bite you. "Manu Tuilagi's hamstring was a bit tight after the Stade Francais game, and he had it scanned and there was the tiniest of strains there. It is nothing serious." Gloucester: McColl; Sharples, Meakes, Twelvetrees (capt), Halaifonua; Hook, Heinz; McAllister, Hibbard, Doran-Jones, Savage, Thrush, Kalamafoni, Rowan, Morgan. Replacements: Dawidiuk, Wood, N Thomas, Galarza, Kvesic, Laidlaw, Burns, Atkinson. Leicester: Bell; Betham, Tait (capt), Smith, Veainu; Burns, Harrison; Ayerza, Bateman, Balmain, Barrow, Kitchener, Fitzgerald, Croft, McCaffrey. Replacements: Thacker, Brugnara, Mulipola, De Chaves, Crane, Kitto, Camacho, Roberts.